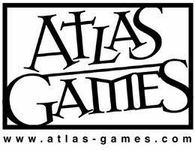 Since 1990, Atlas Games has been delivering fun products to turn otherwise-wasted hours into fantastic adventures and compelling storytelling experiences. They've brought new games to the table, such as Lunch Money, Once Upon A Time, and On the Edge; and given new life to the beloved games they've inherited, such as Ars Magica and Feng Shui. Atlas offers games from the industry's best designers and authors, like Jonathan Tweet, John Nephew, Robin Laws, Chris Pramas, Monte Cook, and John Tynes. Their role-playing products have a reputation for going beyond engaging gameplay and thrills. Products like Over the Edge, Unknown Armies, and Ars Magica have changed the way gamers think about roleplaying. At the turn of the millenium, Atlas Games spearheaded a new movement in the gaming business with the release of Three Days to Kill, the first product in the Penumbra line of fantasy adventure game books. With Three Days to Kill, Atlas Games became a pioneer of the Open Gaming trend and set the standard for d20 System products to come. In 2002 they did it again with the release of Nyambe, the authoritative look at the mythology and folklore of Africa through the lens of fantasy adventures. Today they offer a wide array of respected d20 System titles.